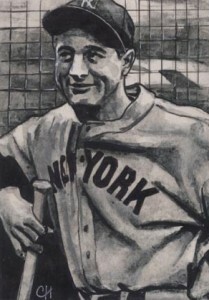 An impressive new Lou Gehrig sketch card by Chris Henderson is aiming to raise funds for ALS. Henderson has produced some of the best sketch cards in the industry for some time. Over the years, he's worked with Topps, In the Game, Breygent, Rittenhouse Archives and more. His sketch card portfolio shows a lot of range, covering such subjects as baseball, hockey, Star Wars and Lord of the Rings. Henderson also likes to push the limits of the medium, often playing with the format. In the past he's made fold out sketch cards and incorporated vintage design flaws and misprints to make new art. The canvas for Henderson's Gehrig card is a blank-front error from 1991 Conlon Collection. The card came with the right back, but the front had nothing on it. That was until Henderson got his hands on it. He saw it as an opportunity to create something that takes the sketch card and makes it more like a traditional base card. Henderson's art, which is done in pen and ink, has a smiling Gehrig leaning against a batting cage, bat in hand. The Gehrig sketch card is currently listed on eBay. Bidding is scheduled to end on Monday, January 9. Ninety percent of the winning bid will be donated directly to the ALS Therapy Development Institute. lou gehrig was the best of his time sorry he went out the way he did,,but till this day he is still doing good for the people..love u lou…..